Plan! Build! Race! 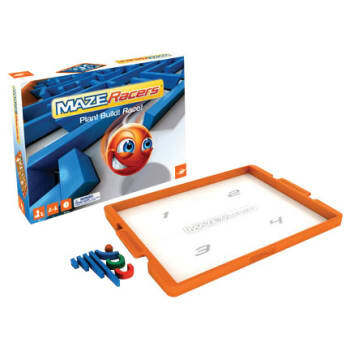 In Maze Racers, players use enclosed magnetic walls and a good dose of creativity to build the most wicked maze possible that will leave their opponent scrambling to find his way out. The game is also a race against time as they compete to build their own devilish contraption. When the time is up, both sides switch their maze boards and steer a ball through the competitor`s maze as quickly as they can. Be the fastest in two out of three rounds to claim victory!